The Jarvis Models AST-102 / AST-103 — testers for Jarvis’ Models USSS-2 and USSS-2A non-penetrating pneumatic stunners. 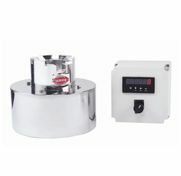 Fast, accurate device for testing and calibrating Jarvis’ USSS-2 and USSS-2A non-penetrating pneumatic stunners. Safe and precise method for testing stunner. Durable construction ensures long service life. Economical and simple to operate. Lightweight, easy to assemble and store.